What a gorgeous bright day we had today - perfect for painting en plein air. It was cold, but with lots of layers on and a flask of hot coffee made, off I went to set up in our garden. 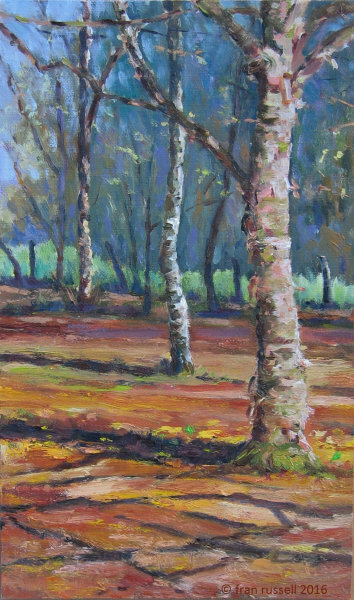 I wanted to finish a couple of paintings I had painted in November of the silver birch trees in our garden. I was relatively happy with both paintings, but felt there was something lacking and decided they both needed some highlights to make them complete. With the paint touch dry, it was really enjoyable placing those finishing touches without the risk of muddying the paint underneath. Size: 25 x 15 cms.